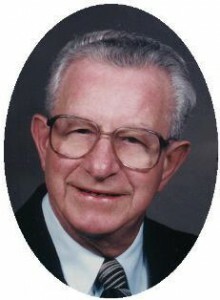 Samuel Rainey, 90, of Pine Ridge Court, Grafton died Thursday, May 17, 2007 at his residence. He was born in Randletown, County Antrim, Ireland on February 27, 1927. In 1952 he immigrated to America. He lived in Milwaukee and Waukesha. He married Berta Boyd Weir of Ireland on September 29, 1970 in West Allis, Wisconsin. In his younger years he played drums in the Milwaukee Highlander Scottish Pipe Band. Sam was a very proud machinist working for the former Kearney & Trecker (now Giddings And Lewis) Company in Milwaukee. He retired in the early 1980’s after working over 30 years. After retiring he moved to Sarasota Florida and later moved to Grafton eight years ago. He was a member of Cornerstone Church in Grafton and enjoyed his bible group and home-cooked meals from his daughter-in-law Jeanne. He is survived by his wife Berta of Grafton, step-son Brian (Jeanne) Weir of Port Washington and granddaughter Erin (Michael) Williams. Further survived by two nieces and a nephew in Ireland and friends. He was preceded in death by step-son Collin, sister Margaret and brothers Willie, Gordon and Tom. Pastor Joe Stillone will officiate funeral service 9 AM Tuesday, May 22, 2007 at Cornerstone Church, 1415 2nd Avenue, Grafton. Family will receive friends after the service. Interment will take place at Wisconsin Memorial Park, Brookfield, Wisconsin. Memorials to charity of choice appreciated.